I’ve officially lived in New York City for one month. I want to say that I’ve been putting my beautiful black-counter-topped, white-subway-tiled kitchen with cherry cabinets and gas stove to good use on a regular basis, but shoot, kids. I live in New York City. Do you even know how much food exists here? I experience moments of overwhelming anxiety whenever I consider how many restaurants I have to eat at while my metabolism still allows for reckless eating. It’s a rough life. Also, I’m in love with Brooklyn. In love. I see no reason to leave on the weekends when there are flea markets and food markets and farmers markets to be visited and general exploring to be done. But, every Sunday, I make lunch for the week. This was last week’s lunch. Sometimes I even paired it with salad. 1) Blend flour and salt in processor. Using on/off turns, cut in butter and shortening until pea-size pieces form. With the machine running, add enough ice water by tablespoonfuls to form moist clumps. Gather dough into ball; flatten into disk. Wrap in plastic; refrigerate 1 hour. Soften dough slightly before rolling dough out. 2) Roll out dough on lightly floured surface to 12-inch round. Transfer to 9-inch-diameter tart pan. Trim dough overhang to 1 inch. Fold overhang in; press to form double-thick sides. Pierce bottom of dough all over with fork. Refrigerate 1 hour. 3) Preheat oven to 400 degrees. Bake crust until golden, piercing with fork if bubbles form, about 20 minutes. Cool 5 minutes. Reduce oven temperature to 375 degrees. 1) While the tart crust is being refrigerated in the tart pan, slice squash in half and place on cookie sheet. Drizzle with olive oil, sprinkle with salt, and roast for 40 minutes or until squash is soft. 2) Heat a pan on the stove over medium heat with a few tablespoons of olive oil. Cook onions for a few minutes to soften, then add balsamic vinegar. Cook for 20 minutes. 3) Beat together eggs, sour cream, heavy cream, goat cheese, cayenne pepper and ground pepper. After the squash cools, remove it from the skin and combine with egg mixture. 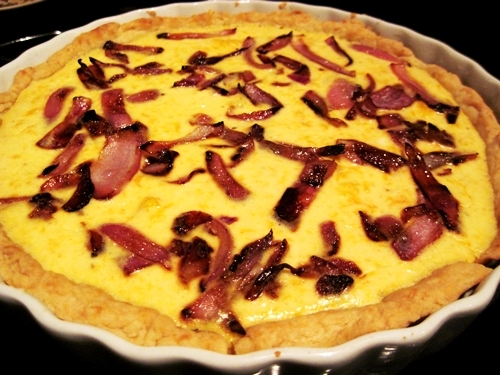 4) Pour the filling into the tart and sprinkle with caramelized onions. Bake for 20 to 25 minutes at 375 degrees. Why, yes, I’m still on an all-I-wanna-eat-is-vegetables (and legumes) kick. I’m also on an all-I-wanna-do-is-have-some-fun kick (see: Crow, Sheryl). Like, suddenly, in my last two weeks of being between childhood and adulthood, being in a kind of maturity limbo where I’m accountable for my actions, but not entirely for my bank account, I’m ready to cram four years of college experiences into half a month. It’s fun. Exhilarating, exciting, terrifying, promising, all wrapped up into one moment in my life. 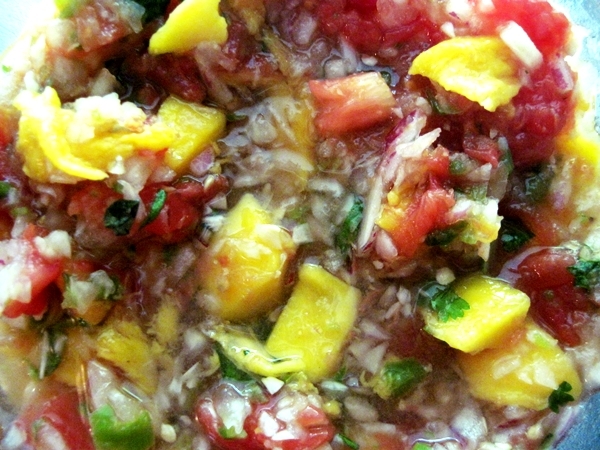 1) Combine all ingredients in a large bowl. Break up the black beans with a potato masher or your hands. (You could also use a food processor, a la green lentil burgers.) Cover bowl and refrigerate for 30 minutes. 2) Heat a pan over medium-low heat with several tablespoons of vegetable oil. 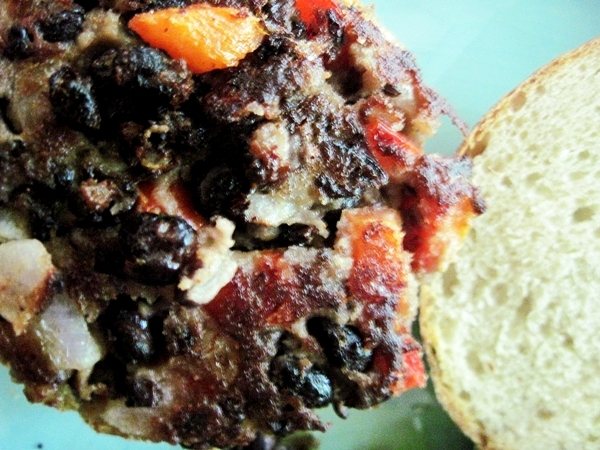 Take a small fistful of black bean mixture and shape into patties. Place on pan. 3) Cook for three to five minutes on both sides. (Flip the patty when the edges begin to brown.) Sometimes I add a slice of cheese right after the flip. Or, after I put the patty on a bun, I spoon some sour cream on top. All I want to eat in this weather is vegetables. (And cheese, which is a year-round need. But mostly vegetables.) 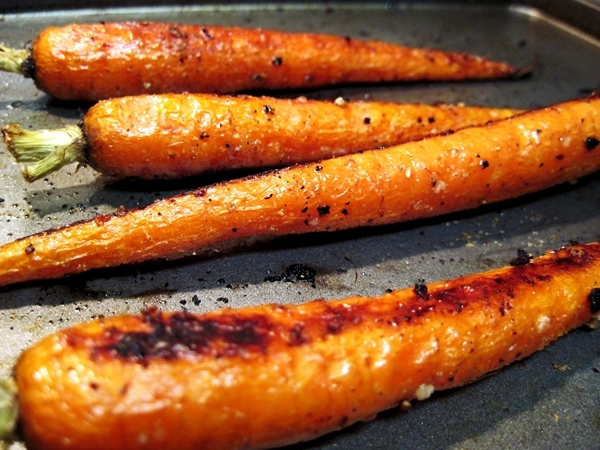 My favorite way to eat most veggies is roasting them. I think I’ve shared my love of vegetable roasting before, so this recipe is nothing new. 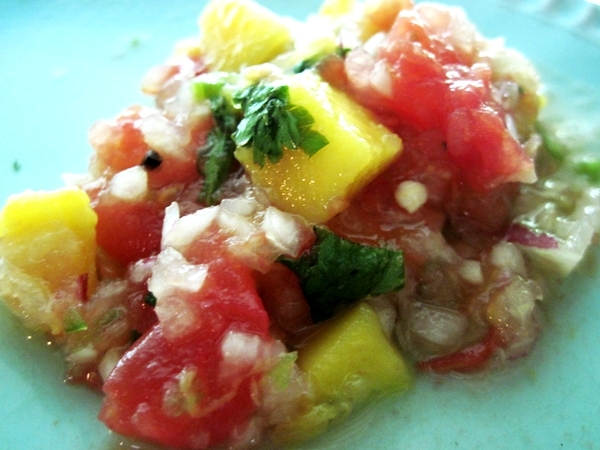 This recipe is also embarrassingly easy; I hesitated to post it. There’s so much I want to say, folks, but no time to say it at the moment. 1) Preheat oven to 400 degrees. Cut the stems of the carrots, leaving about 1/2 inch of green stem. Sprinkle with olive oil, minced garlic, sea salt and pepper. Surely you recall the hummus debacle that occurred in my kitchen several weeks ago. I’m happy to say that I’ve more than redeemed myself in the weeks since then, and I’ve managed to recover my favorite pot (and get rid of the burnt popcorn smell that pervaded our apartment). This time, I decided not to soak the chickpeas overnight because I wanted hummus that day. I’d still recommend overnight soaking to preserve more of the nutrients that hours of cooking can leach out, but it’s your call. Also, I roasted the garlic because I could. Next time, I’ll also roast a red pepper to throw in there. If you decide not to roast the garlic, you might want to add fewer cloves. Don’t say I didn’t warn you. By the way, don’t forget to RSVP if you’re a judge for the cookie tasting! I’m stoked to have another excuse to eat cookies. 1) If you’re cooking your chickpeas, follow these directions, otherwise, skip to step 2. You only need one cup of dried chickpeas since they’ll expand so much. Place them in a pot with three times as much water. If you’re soaking them, add more water before cooking. Otherwise, bring the chickpeas to a boil, then let them simmer for about four hours on medium-low heat. I put a bay leaf in the pot for additional flavor. Let the chickpeas cool and save the chickpea cooking water. 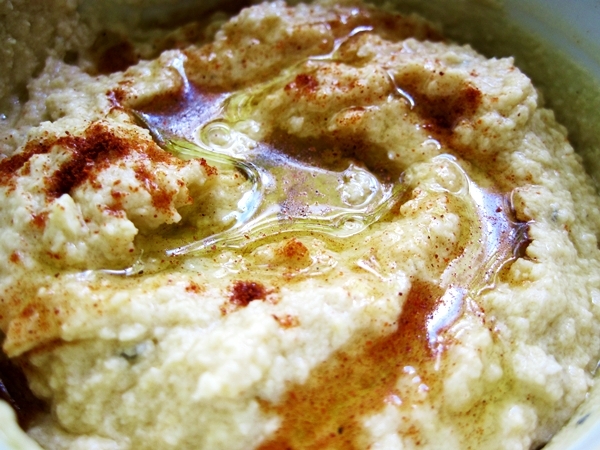 2) Put the chickpeas, tahini, oil, garlic, lemon juice, salt and pepper in a food processor or blender and process. Scrape the sides and bottom several times to make sure all ingredients are well combined. Every once in a while, I experience a pang of homesickness for London. After all, nine months have passed since I cried my way from Notting Hill to somewhere over the mid-Atlantic and grinned my way from that point homeward. I’m totally allowed to wax nostalgic if I so choose. When I first met you, I had the sensation that you were kind of a baby … in the sense that there was so much potential waiting to come to life. I only “knew” you for four months but during that time, I felt that you grew up a lot and, like with me, London is still crawling its ways into your soul and heart and brain and self and it’s still helping you grow up to this day. And I mean growing up as a full individual, not growing up to become the ‘grown-up’ with a job and a house and a husband. You can grow up to that, but grow up to yourself first. Isn’t that a lovely sentiment? In many ways, London brought me to this blog, to this moment, because while I was there I used food to bring me home. Now that’s some kind of wonderful symbiosis. And now I’m bringing myself back to London through the delightful medium of pastry dough. In case you were not previously aware, the English are a savo(u)ry-pie-and-pastries people. Shepherd’s pie, cottage pie, pot pie, pie-pie. Frankly, I’m shocked/disappointed that we didn’t all run around in pastry crust like pigs-in-a-blanket, simultaneously shielding ourselves from cold and combating hunger. 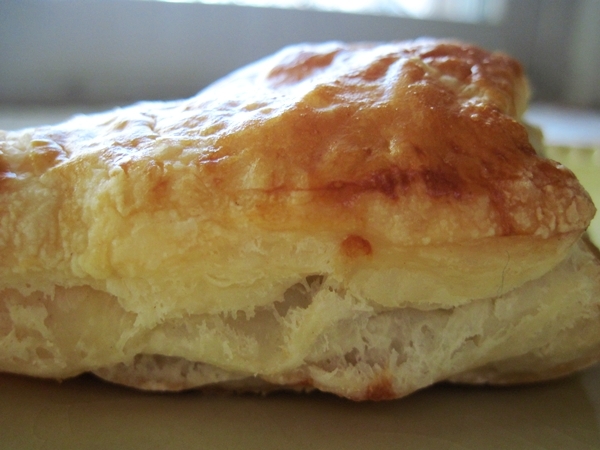 This turnover recipe reminds me of London in all the best ways. 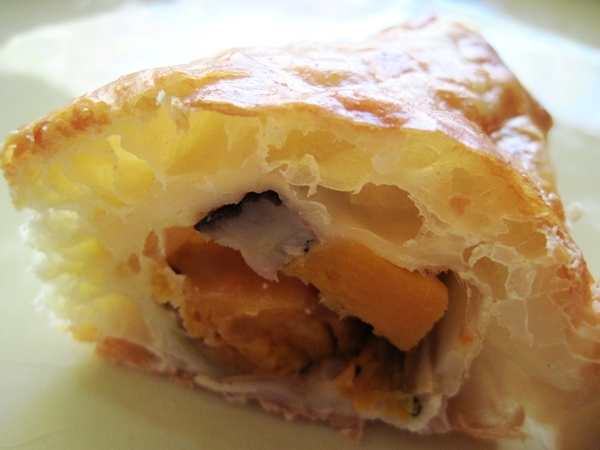 Warm and buttery, with a surprise inside. Perfect for cold days in particular. 1) Preheat the oven to 375 degrees. Line a large rimmed baking sheet with parchment paper. Place the squash on the sheet, drizzle with two tablespoons of olive oil, season with salt and pepper, and bake for about 25 minutes, until softened and starting to brown. 2) Meanwhile, in a large pan, heat two tablespoons of the olive oil, add the leeks, and cook over medium-low heat until softened, about 5 minutes. Add the mushrooms and cook for about 5 minutes. Stir in the garlic and the thyme and cook for 2 minutes. 3) Season with the butternut squash with salt and pepper and toss with the butternut squash in a medium-sized bowl. 4) Using the same baking sheet, line with parchment paper. Roll out puff pastry dough on a floured surface until it’s about a 12-by-16-inch rectangle. 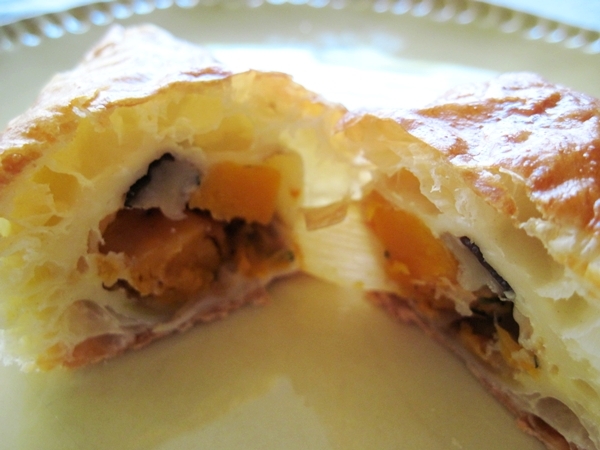 Cut pieces of pastry into squares, place a tablespoon or two of squash and mushroom mixture into the center of each, and top with cheese. 5) Brush beaten egg around the edges of the squares. 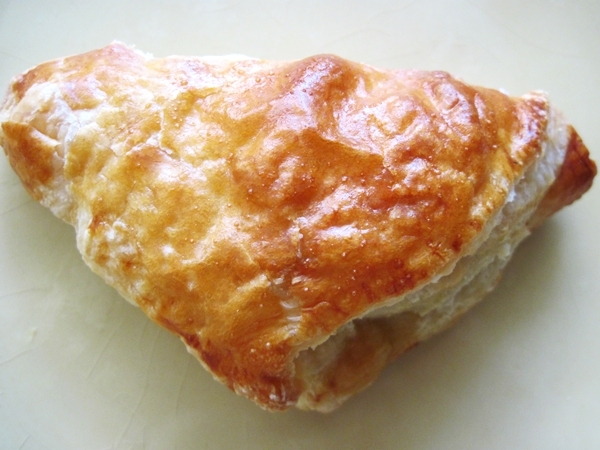 Fold the pastry dough over to form triangles and crimp with your fingers or a fork. 6) Place completed turnovers on the baking sheet and brush with more egg. Bake for 20 to 25 minutes, until pastry dough is golden brown. By the way, you have exactly 59 more minutes to enter for your chance to win free baked goods. Uhh… why wouldn’t you? Bathing suit season is still months away.